1. A couple of weeks ago I ran my first race in 2 1/2 years. It was small. 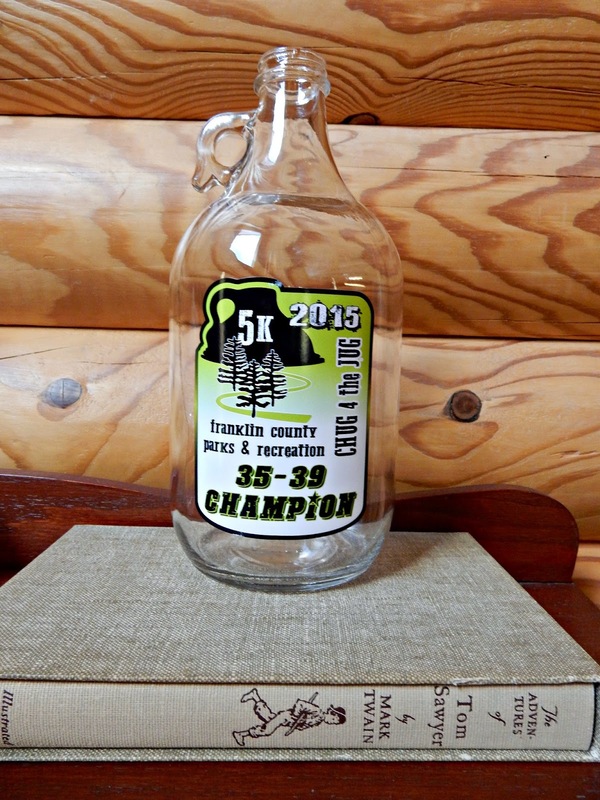 So I placed first in my age group and won a handy dandy moonshine jug. 2. The twins finished their dolch word lists. We have been working on them since October. Each list is ten words long and there are 22 lists. So they are reading simple books now, and we hope to expand that over the summer. 3. Pierce got glasses, which you may have noticed from Monday's post. He was getting headaches. Turns out he had a bit of a lazy eye that was so mild we didn't notice it. Hoping the glasses will help, so that he won't need to have surgery. Cort, "Wow, look at all that hair". Reid, "He sure is hairy". Cort, "Do you think he is a werewolf?" Reid, "He could be part wolf." Pierce, deadpan, no humor, "Maybe he is just having a bad hair day." Pierce, "Mom? What's so funny?" 5. Speaking of summer, I hit the book sale at the library and picked up a ton of fun kid's books for this summer, at 25 cents a piece. In my house, there can never be too many books, and there isn't a kindle to be found! But the jug is empty? I stay away from walmart, there are werewolves there and hell hounds. #1 Empty? What a prize. #2 I bet that they spell better than I can. #3 I hope that the glasses do the trick. #4 Everyday is a bad hair day. #5 Every house house should have a lot of books. oh my gosh, love their conversation over the hairy man, that is hilarious! what a score on the books...love books..i have a nook but have not read a single book on it ha, prefer the real thing...congrats on your race win...a friend of mine just raced in a bootlegger race at expore park and won a cute little mason jar! thanks for linking and have a happy mother's day! Congratulations with the run. I have lots under my belt but it will be a while before even a short one. Love the conversation the boys were having, and Pierce's deadpan humour! Your boys are great...smart, fun and funny too! You sound like one of my daughters....she has two little girls and I couldnt begin to count the books in their house...and no Kindle either! But that is certainly a good thing! Have a great weekend. I still miss the "little brown jug" they used to give out for that race. I hope Pierce's glasses help. Does he mind wearing them? You can buy moonshine now in the Virginia ABC stores. Haven't times changed! Oh my Lord! That is the funniest thing ever! Your posts on your boys just keep me chuckling. I just laughed my head off at your boys and the hairy man. Sometimes kids can just delight you with their 'common sense'. I love my kindle...but there are books I want both versions of. LOL Just in case something ever happens to my kindle. Good to know you have not been hitting the bottle. What an odd trophy. Congratulations!!! I would love to see you run sometime. The boys' conversation is hilarious!!! And Pierce actually topped the werewolf thoughts. What does he think about wearing glasses? It seems ALL the kids wear glasses now! Ella and Anne Marie do. It makes me wonder if kids eyes are getting worse or if we just have smarter doctors. A bad hair day! LOVE it! No kindle here either, I want the "real thing". Congrats on your win, Lisa. I didn't realize it has been that long! In our house everyone reads regular books, except me. I am the one with the Kindle. We live so remotely, that buying a book requires internet shopping/shipping or a one hour drive to a bookstore. Your boys sounds like some fun, little guys. That's quite a deal on the books! I agree, can't have too many. Congrats on the race win. Love that they gave a moonshine jug. That's different than the ordinary medals they usually hand out. Your boys are too precious. Happy Mother's Day! Love that jug! Hope the glasses work. Hi there, Just stopping by to say “Happy Mother’s Day” to you. I’m sure you are having a fabulous day. I celebrated yesterday when one of my sons and his beautiful wife came to see us…. As you probably know, we’ve been out-of-town this past week and I haven’t done any blogging much at all. I hope you enjoyed my two Tulip blog posts while we were gone——and be sure and tune in tomorrow morning to find out what we’ve been doing this past week…. Enjoyed your post today. Congrats on your run... Hope Pierce's eye problems won't get worse. 1. Congratulations ! :) Lovely jug. 3. Aw... hope the problem can be corrected. Am scared of surgery too. Your boys crack me up! I love the ware wolf story. I hope Pierce's eye do get better. My oldest nephew have bifocals from the age of 4 to middle school. I'm not trying to scare you. He had a crossed eyes problem. His eyes were the worst I've ever seen. Now he wears contacts. Congrats on the win....but a moonshine jug??? That is a lame prize, no?? Pierce is so funny! Well, I hope those glasses do the trick. If you lived here I could tell you where to get your jug filled. I love your boys! They are so cute..."Maybe he's part werewolf!" How could you not laugh? I'm gearing up for summer reading this summer too. It will be a challenge since my son has already declared that he likes math better! Good luck!